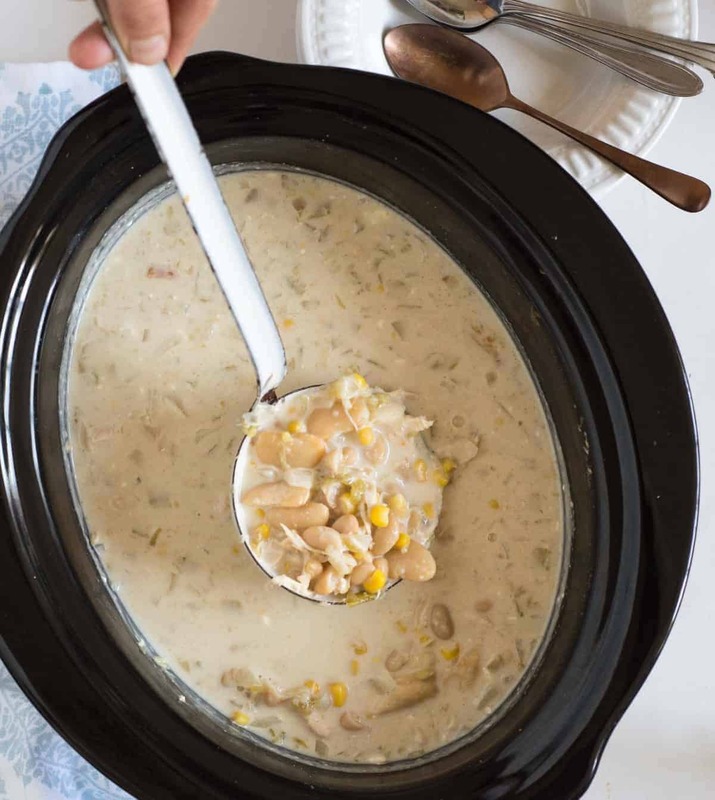 The best creamy slow cooker white chicken chili on the block. This recipe is super easy to make, cooks by itself, and is a chili cook off winner! We love all things chili in the fall and winter and this creamy slow cooker white chicken chili is probably one of my family’s all-time favorite soups or stews. It’s creamy, packed with veggies and beans, so easy to make, and budget-friendly for feeding a crowd of people (one pound of meat can feed a family twice when you make this recipe!). 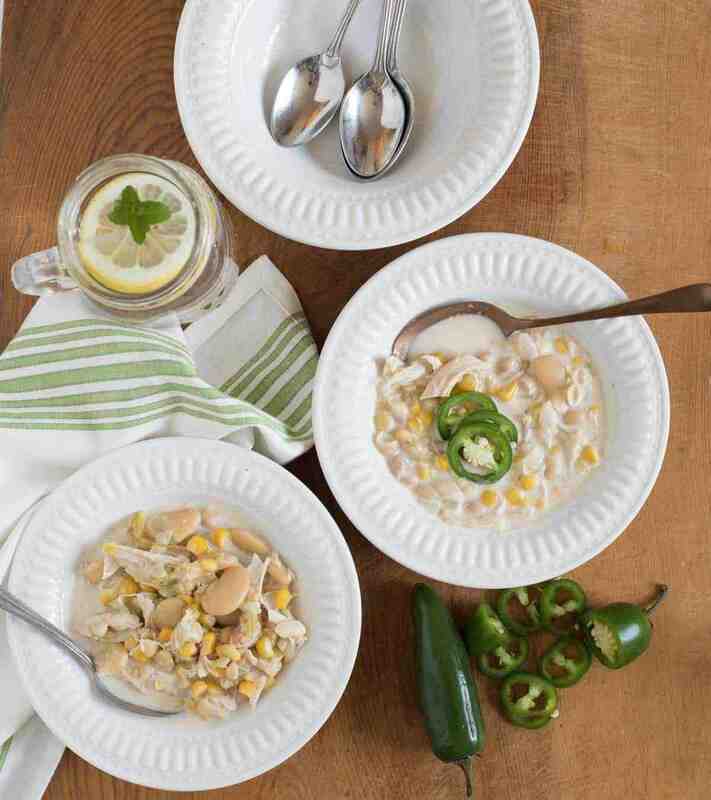 Plus, this slow cooker white chicken chili is a chili cook-off winner; yes I’m tooting my own horn. It’s a simple recipe that you will make over and over again. Slow cooker recipes are a life-saver aren’t they? We are SO close to moving into our house (still maybe 8-12 weeks out but when you’ve been working on it for almost two years that sounds really close). So we spend a lot of evenings over there working – a DIY house build is no joke and takes a ton of time. I have really relied on my slow cooker to make dinner happen so many nights. It’s awesome because it works away while I’m working, too. You can use just about any boneless skinless chicken that you have. Breast, tenders, and thighs all work. If you love chicken, feel free to double the amount but I don’t think you’ll need to. 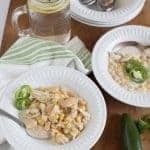 This white chicken chili is great with a side of cornbread muffins, healthy pumpkin muffins, or sweet potato biscuits. I also love it with my favorite fall salad. If you are taking this chili to a chili cook-off, I’d recommend investing in a slow cooker with a clamp-on lid. After losing a whole slow cooker of meatballs on the way to a party in the back of my suburban a few years ago, I’ll never go back. 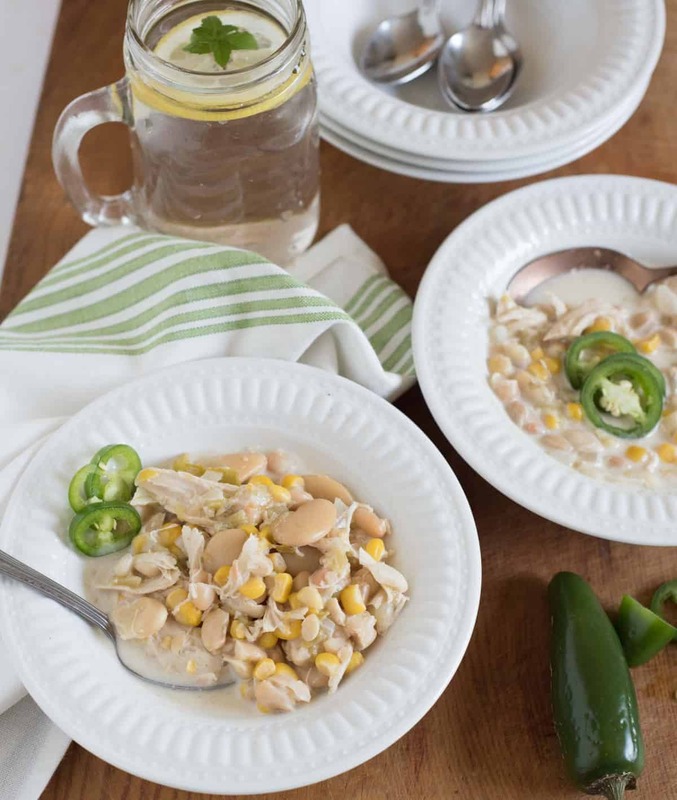 The best creamy slow cooker white chicken chili on the block. This recipes is super easy to make, cooks by itself, and is a chili cook off winner! 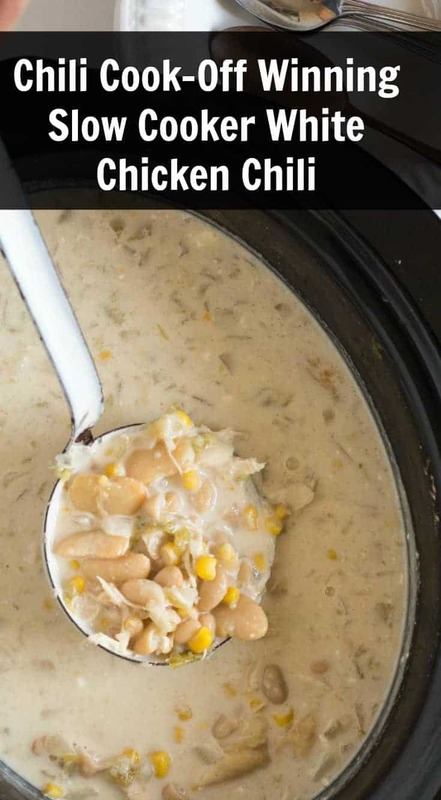 In a large slow cooker, place the chicken, diced onion, beans, corn, green chilis, seasonings, and chicken broth. Cook on high for 4-5 hours or on low for 6-7 hours or until the chicken is tender and shreds easily with a fork. When the chicken is cooked through and tender, remove it from the slow cooker and shred with two forks. Return shredded chicken to the slow cooker and stir to combine. Cut the cream cheese into 1 inch cubes and add them to the slow cooker. Stir to combine until the cream cheese melts. Adjust the seasonings to taste, adding more salt, pepper, and cumin as needed. Serve warm right away and store leftovers in an air-tight container in the fridge for up to 4 days. You can add a half cup of chopped cilantro when you add the cream cheese if you’d like – it’s great in it. We LOVE butter beans (they are super big and creamy), but if you can’t find them, just add another can of great northern beans. How easy is that? And it’s so very good. I promise your whole family will love this soup. Looking for more easy slow cooker recipes? I have a bunch! Our favorites include these chicken legs cooked in the slow cooker (only 5 ingredients! ), honey teriyaki meatballs (great for a party or served with a side of baked potatoes and steamed veggies for dinner), slow cooker refried beans, carnita meat, and veggie lasagna also top my list. Have a great day friends and happy slow cooking from my kitchen to yours. Do you drain/ and or rinse any of the canned ingrefients? Yes, the beans and the corn. Thank you for asking that, I’ve updated the recipe to reflect that so that it’s more clear for you! I always appreciate the help. I currently have two! https://amzn.to/2PiQOEC I’ve had this one for a few years and love it. I LOVE that the lid clamps on. I take my slow cooker to church with soup or chili in it for activities, to my friends for dinners, and to my mother in law’s all of the time for family stuff. I lost a whole slow cooker of meatballs in the back of our car once and bought this the next day. I love it because I can travel with it and that’s something that I do pretty often. #2. https://amzn.to/2Q6yZxI America’s Test Kitchen sent me this one when they sent a copy of their slow cooker cookbook. It’s their #1 rated slow cooker. I love it! The shape of the insert is very oblong and it can fit a lot in it. I trust ATK’s opinion on everything and it’s a great slow cooker. If you aren’t taking yours anywhere, you could also get this one. It has a few more bells and whistles than the other one. I think they are both great and I have liked owning two, but buy one based on if you want that clamp on lid or not! Are you using frozen chicken breasts? If not can you? Frozen will work fine, just add additional time so that the chicken has time to cook through and be cooked long enough to shred easily. If it’s cooked through but doesn’t shred well, you can just chop it up with a knife too.